GM Walter Browne. In the first volume of a two-volume dvd series, Six-Time US Champion GM Walter Browne, with the assistance of GM Ron Henley, discusses and analyzes the various methods that White has at his disposal to avoid the full-blooded confrontation of the Najdorf. Browne systematically explores White systems such as the Closed Sicilian, Grand Prix Attack, 3.Bb5+, the Alapin Variation, and others, as he delivers the viewer his fine-tuned remedies for the player with the Black pieces who has been diverted from his Najdorf (or Dragon or Scheveningen) intent. 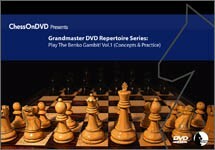 Grandmaster Repetoire DVD Series Play The Sicilian Part 1 (Najdorf) by Walter Browne 79 minutes GM Walter Browne. In the first volume of a two-volume dvd series, Six-Time US Champion GM Walter Browne, with the assistance of GM Ron Henley, discusses and analyzes the various methods that White has at his disposal to avoid the full-blooded confrontation of the Najdorf. Browne systematically explores White systems such as the Closed Sicilian, Grand Prix Attack, 3.Bb5+, the Alapin Variation, and others, as he delivers the viewer his fine-tuned remedies for the player with the Black pieces who has been diverted from his Najdorf (or Dragon or Scheveningen) intent.